Soil compaction prevents moisture penetration, reduces fertiliser and chemical utilization and hinders plant growth. In some cases, yield losses can run as high as 30% due to soil compaction. Spectrum Technologies is pleased to announce the new SC-900 Soil Compaction Meter to make better soil management decisions based on field specific data. The SC-900 helps identifying and addressing specific problem areas on-site and in real time. Soil Compaction meters are used to determine the density of soil and other material. An operator pushes a rod with attached (ASE standard) cone into the ground. The resistance of the cone as it is pushed in the ground is measured and recorded in memory. Compaction data is recorded and displayed at one inch intervals. 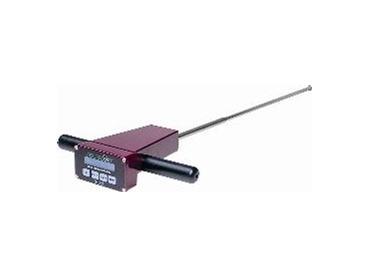 The built-in data logger enables the user to make georeferenced soil compaction measurements for correlation with yield maps and eliminates the need to record data manually. Included software allows users to download data, change logger settings and configure the meter. The new SC-900 Soil Compaction Meter is available from John Morris Scientific .